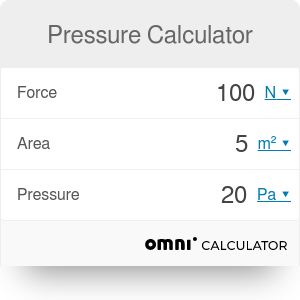 With our pressure calculator, you can estimate the pressure which is exerted by force on a specific area of a surface. In the text below, we have explained what is pressure and what are the most common types of pressure. Read on if you want to learn about pressure definition and pressure formula. You can try our pressure conversion calculator to see how many different units pressure have and how you can calculate them. aerostatic pressure - the pressure inside the gas arising from its own weight. Check our air pressure at altitude calculator to find the atmospheric pressure at any altitude and temperature! hydrostatic pressure - analogous to the aerostatic pressure, but in this case, exerted by liquids. acoustic pressure - deviation from the average value of atmospheric pressure, occurring during the propagation of an acoustic wave in it. You can compute the pressure of sound with our dB calculator. A is the area of the surface. This pressure definition relates to the force which is applied perpendicularly to the surface of the object. You should remember that pressure is scalar and therefore it has no direction (as opposed to the force). differential pressure which is zero-referenced against other, specific value of pressure. Pressure Calculator can be embedded on your website to enrich the content you wrote and make it easier for your visitors to understand your message.